This bat is sure to be one of the most memorable gifts you could give to a new parent. Each bat is hand-cut to your newborn’s exact length. You can add three lines of text, such as name, birth date and birth details. Coaches— are you tired of giving out the same old plastic trophies that just collect dust on a shelf? Well, now you can give out unique team awards in the form of a team-colored and customized trophy bat. 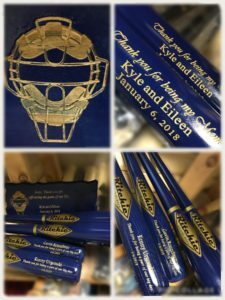 This bat is sure to be the most memorable trophy your players will ever receive! A 15% discount applies to orders of 12 or more! Just use coupon code TROPHY at checkout. 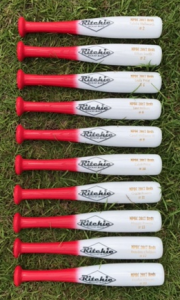 RIGHT NOW YOU CAN GET THESE BATS AT SPECIAL BULK PRICING! 6-19 BATS IS 15% OFF USING COUPON CODE NOVELTY15. The primary use for this Ritchie Novelty Bat is decoration. It is not made from our PRIME wood therefore it comes to you at a much lower cost. 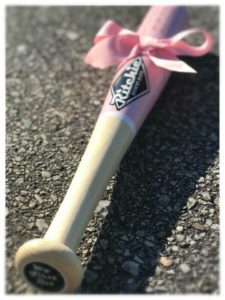 This bat makes a great wedding, birthday or anniversary gift. These bats are 31” – 34” in length and can have an image, a signature and/or up to three lines of text all included in the price.